I hate breakfast cereals you can buy in the supermarket. You really shouldn’t be starting off your day with that much sugar, you will crash by 11am. Porridge is normally my go-to breakfast that is filling and healthy, but, on a beautiful day like this that is just a bit too hot. 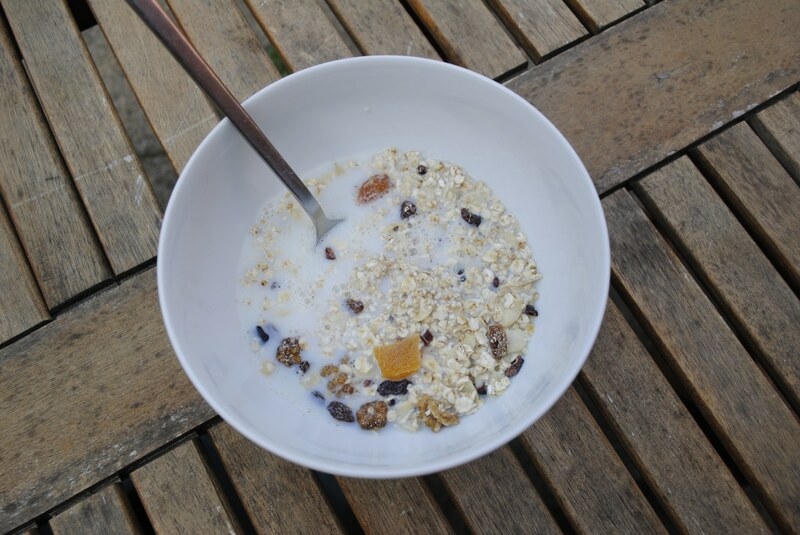 As I refuse to turn to the Coco Pops, muesli is a great choice. You can of course buy this in the shop too, but take a look at the back of the box, most brands have loads of added sugar, which doesn’t make it better than the Coco Pops in the end. There are some really good natural brands out there, especially from a good health shop, but it is just as cheap and easy to make it yourself and that way you can put in whatever dried fruit, nuts and seeds that you like. Some people are scared of dried fruit, and although fresh fruit is a better choice, this is still fruit. Don’t go overboard with the dried fruit, but in small amounts it is great. 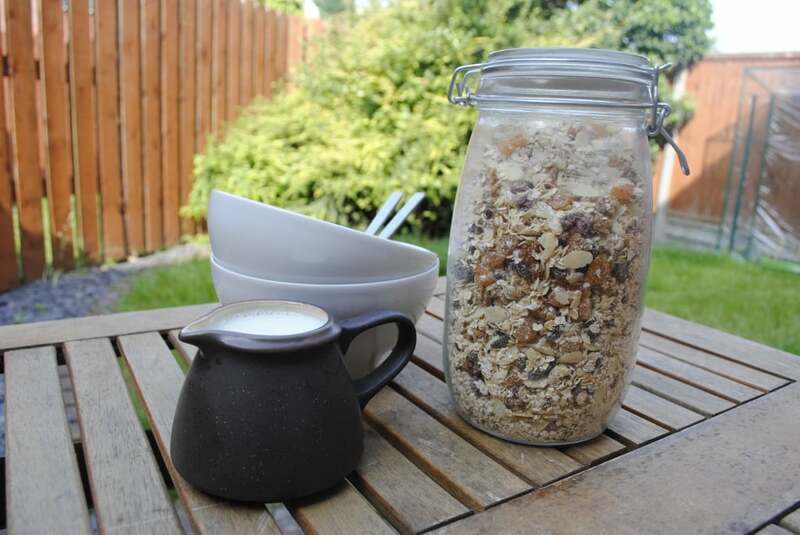 I haven’t put measurements, because when I do a big shop at the beginning of the month, I buy big bags of each of the ingredients and pour them into a big jar (equal parts of nuts, seeds and dried fruit but a bit more oats) and then I take out a 70g measurement for breakfast, which is a perfect serving size with 200ml skimmed milk. 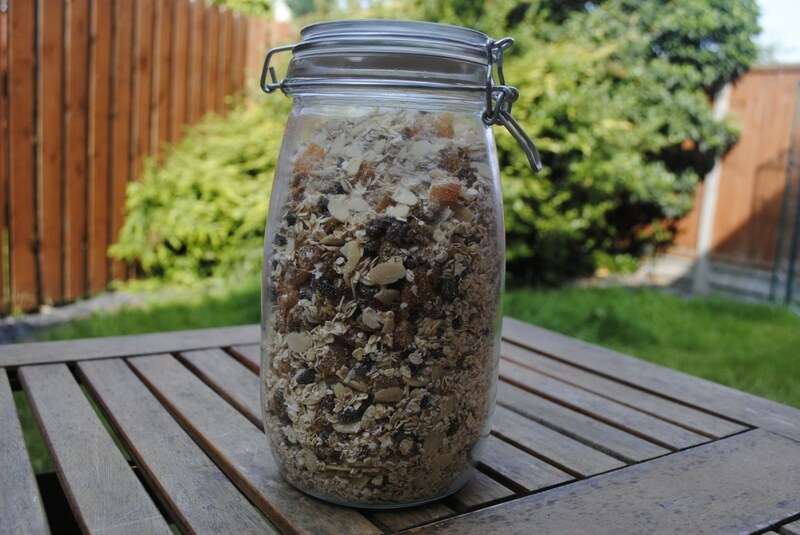 1) Mix everything together in a big jar. I have just made a big batch of this and I am already looking forward to breakfast tomorrow. I make something very similar, but mine has to have dried cherries in it. I love them. 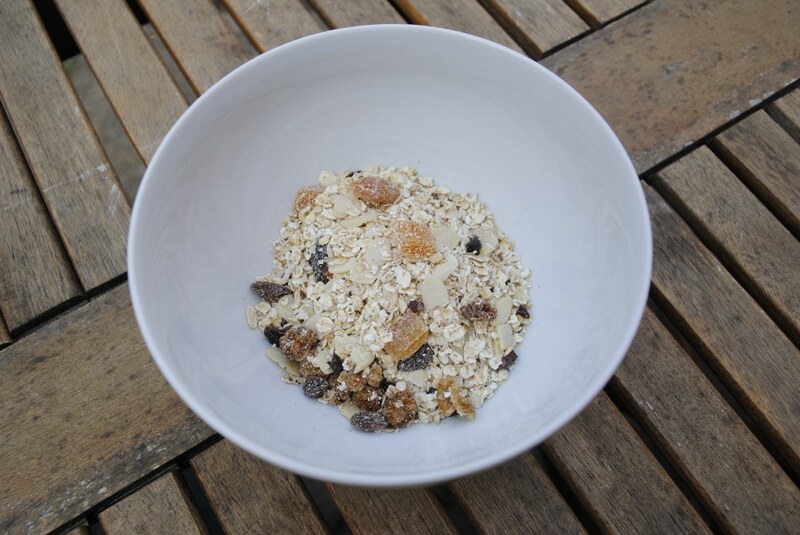 My husband loves muesli, but I thought it was bad for him because of the dried fruit? I trust your opinion and I will try making this myself. He will be very happy. I always buy it for the kids, but I am not sure why. It looks so easy to make and you are right, it will have a lot less sugar in it too. Thanks for the recipe 🙂 I am going to make this after I just looked at the ingredients on the one I had in my cupboard. Why do they need to add so much sugar to it?